Whenever I watch a movie like 300 I always think of how much work the actors must have put in to have the bodies that they have. I wonder not only about the countless hours in the gym they must put in, but also the absolutely insane diets that these people must go on, and how hard it must be both physically and mentally. I did some research to try and find out what exactly it takes to look like the gods in 300. 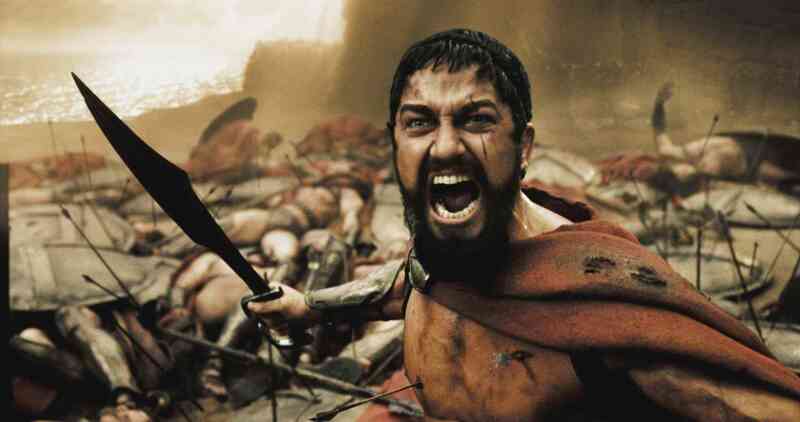 Each ‘Spartan’ had to workout 5 days a week in order to train for their dreaded ‘300’ workout, which got its name for the intense 300 reps that is done during it. Before they were even able to do this workout, though, they worked on several different circuits, volume training and cardio for 90 minutes to 2 hours on the days they worked out. They also had to do fight training for another 4 to 6 hours! Here is what the ‘300’ workout consists of with no scheduled rest between each set. Now before the actors were allowed to do this intense of a workout, they had to first train for months in order to be able to be physically fit enough to do so. They were on strict diets, were only allowed to eat a majority of their food immediately after working out, and were only given enough to recover from their workouts. Just to give an idea of how hard the ‘300’ workout was, only about half of the actors were able to partake in the workout, and the fastest time the workout was done in was 18 minutes and 11 seconds. It is highly recommended that unless you have been training for something like this, you do not attempt to do it. 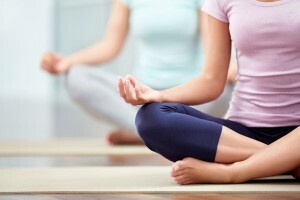 If you are not in good enough shape, you can get seriously hurt. Start off slower and do one of the more intermediate or beginner versions of the workout that can be found here. It is always important to remember how absolutely dedicated you have to be if you were ever look the way that these people do. 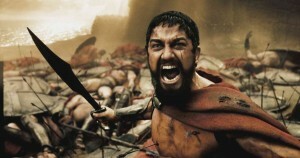 You literally have to make it your job and life in order to look like a Spartan or even a supermodel for that matter. I feel like a lot of people don’t realize how much work people put into looking that way, and are harder on their selves because of it. It’s always great to have goal and nothing is impossible, but you have to have a realistic approach to them as well. Quinoa: This is the first answer I spit out when given the ol’ protein question, (except of course when I was called on in the middle of lecture and was too put on the spot to give an sufficient answer.) For those of you who do not know, quinoa (pronounced Keen-wah) is a pseudo grain. The title “pseudo grain” is pretty misleading because technically it is a seed, so it’s also gluten free! This is an important staple to my diet because it’s one of the few plant proteins that have the 9 essential amino acids all by itself, without combining with complementary proteins. One cup of quinoa has 24 grams of protein! Cook yourself a big batch in the beginning of the week and store the rest in a container to reheat throughout the week! Eat it with either veggies stirred in, avocado, eggs, or chick peas! You can also eat it like you would oatmeal, drizzle some honey on top, throw banana slices on top and sprinkle on some cinnamon! Nuts and seeds: Almonds in particular offer the most protein compared to other tree nuts. As far as seeds go, chia seeds and pumpkin seeds offer a lot of protein as well! You can eat them alone as a snack or add them to your food! Aside from the fact that they are an easy source of protein, they are also good for our heart, support cognitive function and keeps our blood sugar in check. Eggs: Eggs are still a part of most vegetarians’ diet. The exclusion of eggs falls under the category of Vegan rather than vegetarian. One egg has 6 grams of protein, so if you make yourself a 2 egg omelet with perhaps a side of veggies and quinoa, you’re off to a protein packed start of your day! 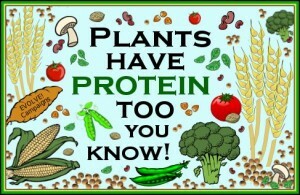 Soy beans: Another huge source of protein! One cup of soy beans contains 68 grams of protein, which is over the average person’s daily intake of protein. Soy beans also contain the 9 essential amino acids, so they are sufficient substitute to meat, which is why tofu is used instead of meat! If you are a vegetarian yourself, I hope you learned something new about plant protein! If you are just curious about how vegetarians get by, I hope you learned that we don’t just live off of grilled cheese sandwiches. Even If you are a carnivore, add some of these proteins to your diet! They are healthy and accessible! There are two main ways to display the information received from the Fitbit: on the Fitbit itself and the Fitbit app. 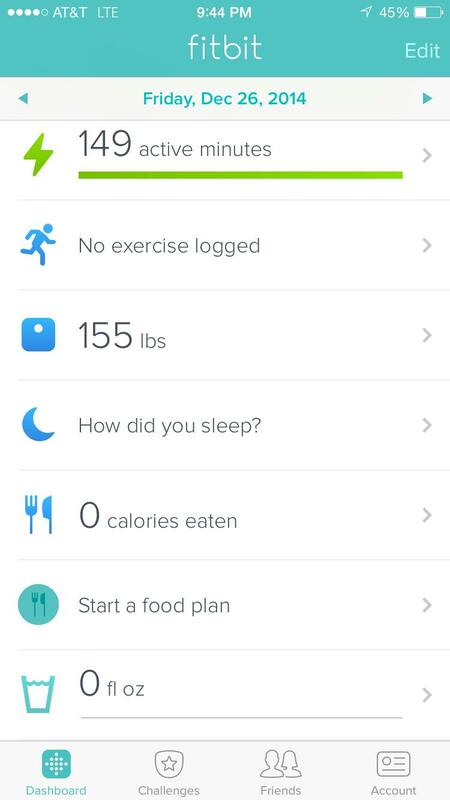 Since the Fitbit Charge has an LED screen, it is able to display multiple categories. It is able to display the time and date, steps taken each day, how many miles you have walked, calories burned, and number of floors climbed. In addition, you are also able to see who is calling your phone on the Fitbit display if you have them synced. You are also able to set an alarm from the Fitbit app to vibrate whenever you have it set. 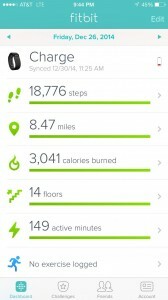 The Fitbit app, which is available for iPhones, Androids and Windows phones, has a much larger selection of statistics. 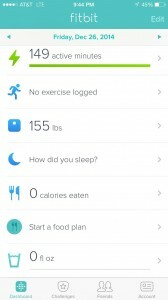 The app has all of the options the Fitbit Charge itself can display, but you are also able to see things like active minutes and how long and well you slept. There are also things that you can enter manually like weight, food consumed, water consumed, and exercises that you completed. You are able to see more detailed statistics from previous days, weeks and months to track your progress. The app is very well designed and I personally have not had any problems with it yet. I find the design of the Fitbit Charge pretty stylish and comfortable for the most part. I am a person who always wears watches so starting to wear the Fitbit wasn’t much of a change. The only weird thing was wearing it while I sleep so I could get statistics on how well and long I am sleeping. I actually find the the Fitbit to be less noticeable since there was no watch head that restricted any of my wrist motions. There are three different sizes (http://www.fitbit.com/charge) which you are able to find dimensions to on the website. The only thing that is slightly annoying to me is that the Fitbit is sort of a rubbery material that can sometimes get caught on my long sleeve shirts and sort of pull my sleeve when I move my arm too much. Other than that, I never notice that I am even wearing it. There is a battery that is rechargeable. I have found that I have to charge the Fitbit about once every 5 days or so. I have been checking it a lot more than I feel I will in the future though since it is new, which drains the battery. It charges in less than an hour so I have been getting in the habit of just charging it while I go take a shower since it cannot be taken into the shower. But I have not had a problem with it dying on me yet. There are also many other cool add-ons you can get to use with your Fitbit app like a scale which is recorded daily and tells you how well you are making progress. There are also fun, motivational badges you get whenever you break personal records and goals. You can compete against friends to see who is the most active as well, which is a pretty cool feature to help push yourself. While wearing my Fitbit Charge I honestly find myself walking more and challenging myself to reach my goals every day. I take stairs rather than elevators and have learned things that I never really thought about, such as how lazy I can be some days and how much sleep I don’t get on others. It’s nice to know when someone is calling and whom he or she is without running to get my phone when it isn’t on me or when I don’t want to pull it out of my pocket. There are only a few things that I do not like about the Fitbit. I do wish that I was able to wear it in the shower, but it is recommended that you do not. It would also be nice if it were solar charged so I wouldn’t have to ever charge it, but charging it isn’t the biggest burden. The last problem is it getting caught on my long sleeve clothing. 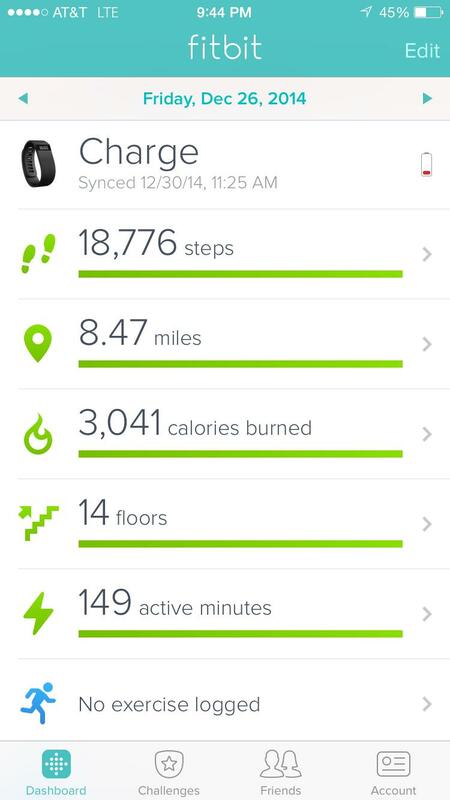 Overall, I do really like the Fitbit. It really helps me be more active because I feel more rewarded seeing all of the steps and active minutes I am putting into each day. It helps me feel guiltier when I take elevators and escalators too. If you can spare the $129.99 for a personal trainer on your wrist I would recommend a Fitbit Charge to you! Let me know if you have a Fitbit, and if so, how you like it!